I just finished drifting the Yellowstone from Grey Owl to Mallards Rest. When we put in at 7AM, no one was on the river. A big difference from the Madison River Flotilla Circus earlier in the week. Bugs are aplenty. Tons of caddis and PMD’s. The river is still high and just off color. Plenty of visibility and should have been hot. The level is a foot or so higher than usual for this time of year. We saw maybe a dozen fish rise all day. Surface action was zilch. The Yellowstone showed its fickle nature again today. 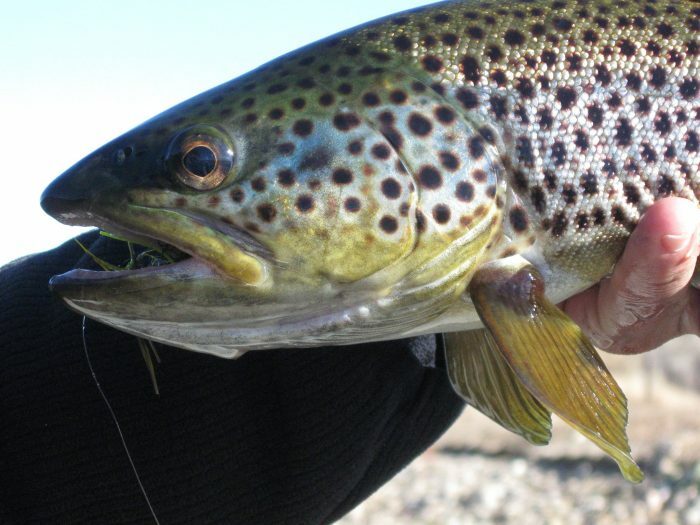 Conditions should have been great but… After striking out on dry flies, I switched over to a big brown rubber legs and a size 12 Prince dropper. Life improved quickly. Later I went to a spinning rod with a silver Blue Fox #1 spinner. The dinner bell was ringing. Slow, deep, and slower was the ticket. The fish were congregated in slower back eddy’s and around structure. Our boat netted around 50 trout from 6-18 inches. Rainbows, cuts, Browns, and whitefish. No fish showed signs of being caught before. This was a far cry from the lip ripped fish on the Madison. All the fish fought strong and hard. We only saw maybe a dozen other boats and one woman caught a small rainbow on a nymph. Plan your trip along a river that is clearer and lower for now. My guess is that in 2 weeks, the Yellowstone will explode! Hoppers are just around the corner! For more Montana Grant, visit his blog at www.montanagrantfishing.com.